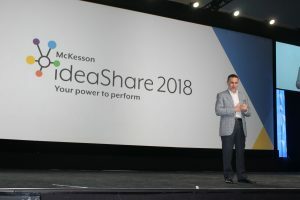 LAS VEGAS — McKesson ideaShare 2018, McKesson Corporation’s annual interactive forum for community pharmacists, kicked off today in Las Vegas. The annual event offers those in community pharmacy the opportunity to improve their knowledge, performance and profitability while networking with industry experts. Nick Loporcaro, president, McKesson U.S. Pharmaceutical and Specialty Health at the opening session. Designed to help Health Mart pharmacies improve performance and patient care, myHealthMart integrates the digital tools available, including the Operations Toolkit. To date, 4,400 registered stores and more than 13,000 individual users are using myHealthMart. Key updates to myHealthMart include simpler, more intuitive navigation and improved access controls, makes it easy for every staff member to have their own myHealthMart account to access the tools and education; updated content and a new platform, Health Mart University offers new ways to learn with shorter courses, audio recordings, video programs and an expanded menu of live sessions; and with the Results Optimizer tool, embedded in myHealthMart, pulls in store-specific data to recommend resources and tools pharmacies can use to make practical changes to their business. Health Mart is launching five new content modules for McKesson ideaShare. The new modules cover adherence, staffing, immunizations and pharmacy tools to combat opioid use disorder. In addition, Health Mart is launching the next generation of the Health Mart Marketing Hub. First launched in 2013, the Health Mart Marketing Hub has been revamped based on customer feedback to allow for easier searching, faster customization and expanded offerings. The new site will feature greater flexibility, giving pharmacies access to hundreds of professionally-designed marketing materials, and expert support. Health Mart is offering on-site consultations with marketing experts to learn about new tools available through the Marketing Hub that optimize the pharmacy’s online presence. McKesson’s RxOwnership is hosting the second annual Women in Pharmacy – Own It event, featuring Mary LoVerde. The Own It program focuses on four key areas: ownership, mentorship, leadership and work/life balance for women. Creating a community of women helping other women succeed, the program includes matching pharmacy students with owners and empowering ownership. McKesson Pharmacy Systems (MPS) will present the latest in technology products and services along with McKesson High Volume Solutions (HVS), Macro Helix and Supplylogix.